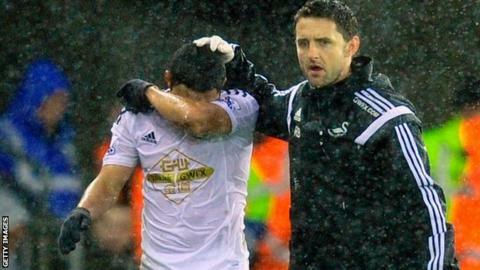 Swansea City winger Jefferson Montero has been ruled out for around a month with a hamstring strain. The Ecuadorian international, 25, limped off during the Swans' 1-0 victory over Aston Villa on Boxing Day. Montero left the field in tears and is set to miss at least four league games, including Monday's trip to Liverpool. "It's not as bad as we thought it would be, which is good news," said manager Garry Monk. "Jefferson all season has been very good for us so he will be a miss, but it's a chance for other people." Montero departed the field after 21 minutes against Villa, after winning the free-kick which Gylfi Sigurdsson scored from. It was Swansea's second successive league win, following on from a 1-0 win at Hull City, to leave Monk's side in eighth place in the Premier League ahead of the trip to Anfield.